Dams has announced that work is well underway to build a new multi-million pound UK manufacturing facility at its head office site in Merseyside. The new 85,000 sq ft building is due to open in October this year, consolidating the four sites that Dams currently operates at Knowsley Industrial Park into one larger site to improve operational efficiencies and boost manufacturing capabilities. Over 80% of products in the Dams portfolio are already manufactured in the UK using the latest technology. In 2017, Dams manufacturing operations made a record volume of products; the wood factory produced over 1.8 million wooden panels in the last year with the upholstery department producing more than 2,000 upholstered products every week. 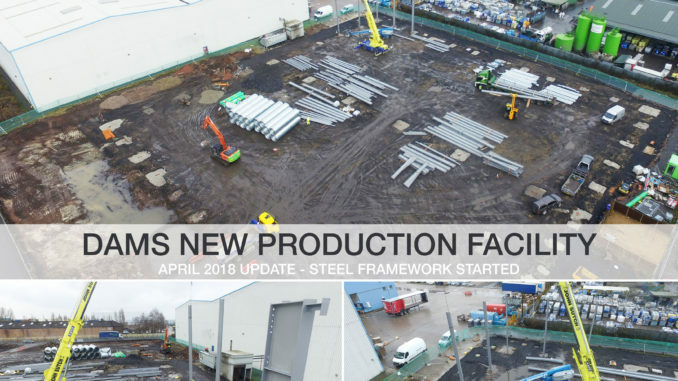 Dams managing director, Chris Scott, said: “We’re a proud UK manufacturer and during 2018 Dams is making record investments expending our UK manufacturing facilities with new machinery, state-of-the-art equipment and additional trained personnel to manufacture the extended product portfolio and keep pace with demand. The latest manufacturing investment will also ensure Dams can reduce lead times on its expanding portfolio of bespoke products.